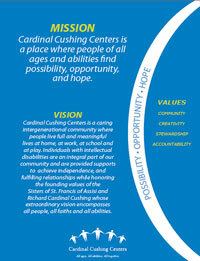 Cardinal Cushing Centers is a place where people of all ages and abilities find possibility, opportunity, and hope. 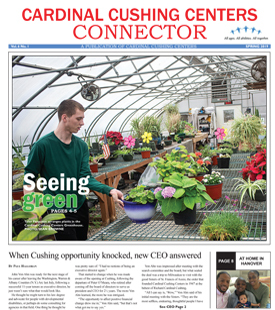 Cardinal Cushing Centers is a caring intergenerational community where people live full and meaningful lives at home, at work, at school and at play. Individuals with intellectual disabilities are an integral part of our community and are provided supports to achieve independence, and fulfilling relationships while honoring the founding values of the Sisters of St. Francis of Assisi and Richard Cardinal Cushing whose extraordinary vision encompasses all people, all faiths and all abilities. Community: We respect the strengths of each person, foster caring relationships and kindness and friendship. Creativity: We encourage independent thinking, learning and initiatives where solutions and approaches can be different than the current ones. Stewardship: We collectively are responsible to oversee and improve the performance of our organization to ensure longevity for future generations. Accountability: We accept personal responsibility to efficiently use organizational resources, improve our services and systems and help others improve their effectiveness.